Recently, after listening to graduation speeches, I reflected on my own life and what piece of wisdom I could give to the next generation. I realized that there was one thing I was never taught, and had to learn the hard way. It’s one of the most important things you can possibly learn in life. From a young age, we are rewarded for success. Failure sometimes comes with encouragement to try again, but almost always comes with it’s own punishment. When we succeed, we move on to bigger and better things, full of self-confidence. When we fail, we may relive the failure over and over in our heads. Many times, we’re told to move on or “get over it”, but is this the right advice? Reliving past failures can be hugely beneficial, if done in the right way. Failure is the best teacher life has to offer. When we fail, our natural instinct is to reflect on the failure. Sometimes these thoughts are tough, and we may try to suppress them, but what we should be doing is learning where we went wrong. The cause of our failure might have been out of our control, but we can still reflect on what we could have done to limit the damage. When we slowly reflect, we have an opportunity to learn, grow, and eventually succeed. That’s a beautiful thing that brings reason to nearly every setback, however, this is not the biggest part of the lesson I learned. In my life, I was wildly successful quite early. I was interested in computers at the young age of 5 and was writing simple programs at the age of 6 (1983), when most people had never touched a computer. By age 16, most people who knew me considered me a computer whiz, destined to be the next Bill Gates. Sure enough, I was making a great living building computers and writing software for the company I started. Within a couple of years though, I found myself working very long hours doing work that sometimes paid off, sometimes lost money. Eventually, the stress got so high that I decided to get a lower paying job in the IT field working for someone else. The early successes in my life gave me a naive confidence that eventually led to some tough life lessons. The truth was, I was basically part of the same market that brought the dot-com bubble. I had done my homework in the IT field, but a big factor in why I was WILDLY successful was timing. As technology made its way into more and more people’s lives, my skills became rare and valuable. As the market flooded with talent, hardware, and other resources, everything got cheaper. My days of not having to compete were over, and I hadn’t realized it. In the meantime, my early successes caused me to think that I understood technology, business, marketing, taxes, banking, and life in general. The truth was, I had a LOT to learn in all of those areas, and the lack of early failures had blinded me to that fact. At the time, nobody had ever even hinted to me that success was a lousy teacher. As you sit here looking forward to the rest of your life, you may have just graduated, and for that you deserve congratulations. After the parties have ended, and the next phase begins, take a moment to assess this success. You might have graduated a 4.0 with opportunities laid out in front of you already, but don’t be complacent. You had great mentors, parents, teachers, and a structured system designed to help you succeed. That doesn’t lessen your accomplishment, but you should take all of this into account when planning what’s next for your life. You will have to imitate or develop a life plan that works for you, and develop it through trial and error. Mentors aren’t always going to be built into life– you are going to have to insure they’re there at all times, or go seek them out. When you fail (and especially when you succeed), you’ll need mentors to help you evaluate what to do next. Learning is very important, but learning the right lesson is key. It’s always important to realize that success and failure aren’t absolute. Don’t let early successes trick you into believing that “you’ve got this.” Don’t let early failures (or me) make you believe that life’s too hard, or you’re a failure. Reflect on your choices and their results. Realize that when we’re doing new things, luck plays a huge role– good or bad. Success doesn’t mean you made all the right choices, and failure doesn’t mean you made all the wrong ones. Every chapter in your life is a lesson. You don’t just learn it by showing up– you have to study. Failure is a great teacher, and she’ll teach you the lesson over and over until you get it. 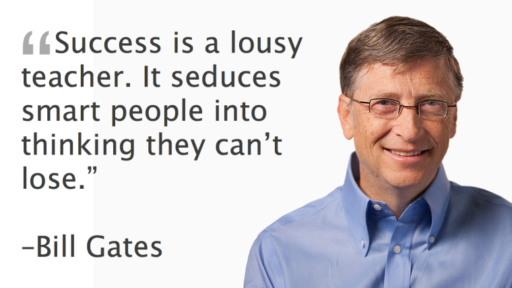 Success, however, is more like that substitute teacher that everyone loves, but never really teaches you anything. If you are to learn from success, you’re going to have to fight your instincts and study when there’s no apparent reason. You should live, love, and enjoy life. Treasure every step of this process– you only get to do it once. Show up with your game face on every day and take nothing for granted. Each day make sure that if you’ve done nothing else, you’ve learned.